Blue Eyes Cattery is located conveniently in Southern Maryland (St. Mary’s County). 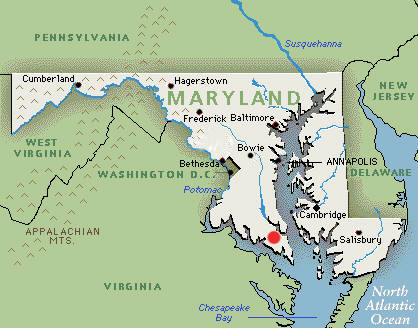 We are only 10 minutes from the Pax River Naval Base and 1.5 hours from Washington DC and Annapolis. We are 2 hours south of Baltimore. Our location is marked on the map above with a red dot. Our zip code is 20686. We take a unique natural approach to cleanliness and sanitation, ensuring that our cats are never in contact with harmful chemicals. Several common household cleaners and disinfectants are poisonous for cats, so we use only natural and safe cleaners in our cattery. We are earth-friendly and recycle or compost as much as possible. Our major appliances are all energy star certified, and our home is extremely efficient. If you plan on visiting Blue Eyes Cattery, please be prepared to remove your shoes at the door, and wash/sanitize your hands before handling kittens and in between litters. You will also be asked to wear clean clothing that has not been in contact with other pets or pet hair. This will reduce the possibility of transmitting any diseases, fungi, or bacteria to our cattery. Inbreeding is the mating of related cats. 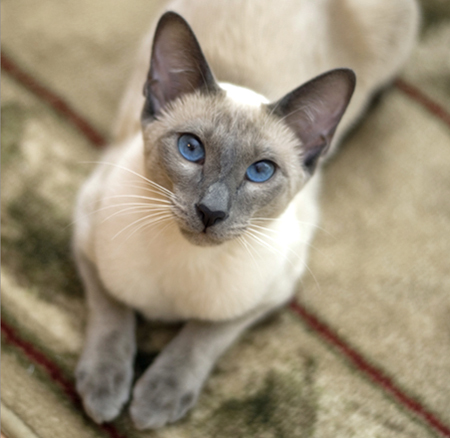 Because of the dangers inbreeding places on a cats health, Blue Eyes Cattery strongly opposes any form of inbreeding! We never mate cats that are related. Inbreeding can cause a variety of physical defects and health problems, including genetic diseases, immune system dysfunction, congenital defects, heart malformation, cleft palate, cryptorchidism, fluctuating asymmetry, low birth weight, neonatal mortality, lower growth rate, and reduced fertility. Our cats and kittens are strictly indoor-only pets. If allowed to freely roam the outdoors, cats have an increased risk of injury and disease. Indoor-only cats live longer and happier lives. We provide climbing condos, multiple scratching surfaces, and window perches to give the cats natural stimulation and exercise without the dangers of the outdoors. Our cats are spoiled and live with us as part of our family. Most commercial cat litter is is loaded with chemicals that can cause serious health problems including asthma, bronchitis, intestinal blockage, respiratory illness, and lung cancer. Cats breathe in the harmful dust when they dig in the litterbox, and they ingest the harmful chemicals when they lick themselves clean. To prevent these problems, we use only natural, biodegradable, clay-free litter. My favorite brands are "World's Best" which is made from corn, and "Feline Pine" which is made from pine. I've also toilet trained several of our siamese (they use the human toilet and don't need a litterbox at all). For more details click on "kitten care" in the menu. Blue Eyes Cattery will never declaw any of our cats or kittens. Declawing is serious surgery- an amputation of the last joint of your cat's "toes". It is a painful surgery, with a painful recovery period (cats can't use wheelchairs). Our kittens are trained from an early age to use scratching posts, so they do not claw furniture. There are also alternatives to declawing available, such as "soft paws" adhesive claw covers. 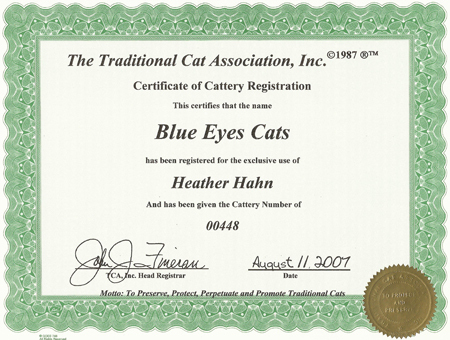 Blue Eyes Cattery is registered with the CFA, TCA, and ACA cat registry associations (CFA registration #218683, TCA registration #00448, ACA registration #14832). Most kittens qualify for double and/or triple registration. Our queens and studs have all received their champion title through TCA. Our kittens have generations of champion and grand champion ancestors. We can show you their pedigrees, much like a family tree. We use food that is biologically appropriate, grain free, all natural, without fillers, and by-product free. We choose only premium brands such as Earthborn Holistic, Wellness Core, Bravo frozen raw, By Nature, Nature's Logic frozen raw, and Weruva. Please visit our "Kitten Care" page for more details. 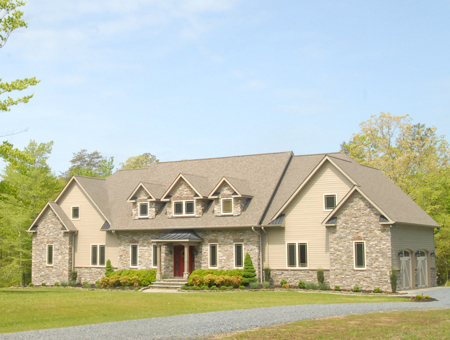 We live in an immaculate 6500 square foot home on 15 acres. I uphold the highest standards of cleanliness and sanitation to ensure that both the human and feline residents can enjoy a clean and sanitary environment. Our home has no carpeted floors (hardwood and tile floors only) to promote the best animal husbandry practices. Clients find our cattery much cleaner and healthier than others in comparison.